The C-HR was definitely intented to be a soft-continuation of the Celica nameplate. It was originally billed as the next major and iconic Scion model when the concept debuted back in 2014 and 2015. The car’s existence makes a lot of sense once you see it as a replacement/successor to the tC for a living Scion brand. The Intent of Celica helps explain why Toyota designed a coupe (as in 2-door) appearance and FWD-only small crossover with manufactired hype. It was expected to grab the tC market while stealing Kia Soul buyers. That’s why Toyota didn’t expect such a sales backlash for not offering AWD. A Scion badge would make it a Korean tall hatch competitor. The problem arises from the Toyota badge forcing the car to be directly against Honda HR-V and even Buick Encore (that’s why XLE subbranding is utilized). That badge switch completely destroys the perception of value and won’t meet consumer/reviewer expectations. Toyota was expecting Scion level volume. They never accounted for the C-HR handling Toyota level volume. The Scion brand was killed quietly like a goldfish and now Toyota has nothing to ease the stress of RAV4 production (which was close to Ram P/U Series sales when I looked a while back). The C-HR will never come close to the sales numbers a REAL Toyota subcompact crossover would account for. 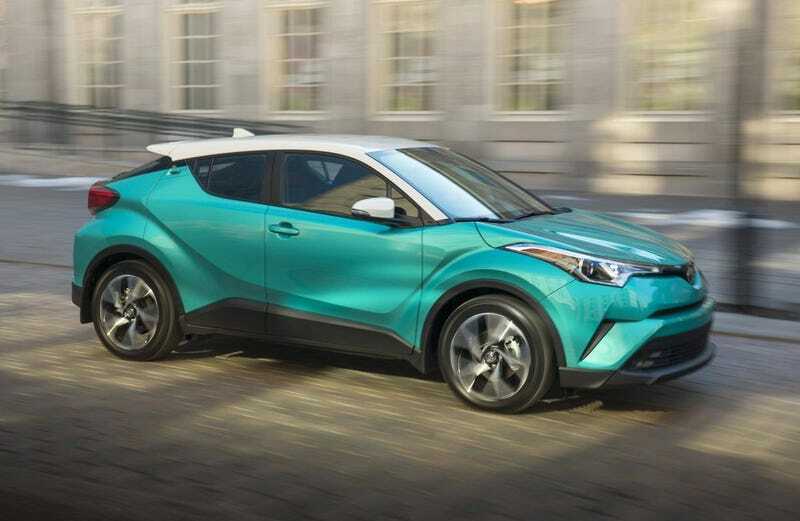 I would not be surprised in the slightest when a Toyota CUV sized between the C-HR and RAV4 appears within the next 18 months and breaks 100,000 sales within the 9 months after release. I think Mitsubishi got word that this was going to be called something like, “Celica HR / Celica X,” and why they thought the Eclipse Cross (EclipXe) name would be on trend. You have to cash in on the equity of an established nameplate when the product itself may not have enough on it’s own to be competirive in the market. Automakers know that the FWD 2-door coupe and hatch are dead and that subcompact hatchbacks without cladding won’t last another 3 years in the US. Tiny crossovers are the way and sporty will always be trendy. Now is the time for automakers to claim a spot at the top of a non-existent segment poised to take off like a part-time employee the weekend after they get their tax refund. This is why the Juke was marketed so furiously to the point of having all the Nissan trims plus Nismo/Nismo RS/R. This is why the Kia Soul became a CUV overnight with its midcycle refresh (making it the best selling Subcompact CUV in the US that year when the HR-V and CX-3 just came out). It’s why Toyota would want to call the C-HR the Celica HR and race it. Heck, these are all the reasons an Eclipse Cross would get approved and why a Honda X2000 could replace the Fit in the US. I will bet you all that Subaru will offer a utility below the Crosstrek and it will be FWD-standard. Do you all know the business case for why Subaru would build the BRZ? Subaru didnt need a performance halo car. The BRZ didn’t introduce any tech, not even EyeSight which has made Subaru the new Volvo when it comes to perceived safety. The BRZ wasnt limited or even requested by anyone, so why would Subaru agree to build a sportscar that isn’t even a flagship? Wouldn’t a Forester STI or WRXtrek be more profitable? Not even close, kin! The BRZ exists in order to get people accepting the idea of a 2WD Subaru. Continuing the nameplate one more generation so that they can sell it next to 2WD Imprezas and the entire utility range gives the complete change of the core dynamic of the brand validity. If Subaru can start charging for their AWD system then they can keep competitive base pricing while enjoying an extra 5-10% profit margin on the exact same cars. Why make $3,000 off of 8,000 cars when you can make $1,000 off of 400,000 every year in the US? That opportunity makes the BRZ a worthwhile investment to continue into another generation but not worthwhile when it comes to developing a range of powertrains and altering production. Spend the minimum, yeild the maximum. Just like education...though in the US, it’s the administration living that, not the students. Wobbles is known for a photogenic memory and being a man of few words that aren’t his own.